Enter your Test Kit ID to access Progene Labs. 1. Enter your Test Kit Id to activate your test or view your results. 2. Have your PIN number handy to view your results. 3. A PIN number will be assigned to you if you are entering this Test Kit Id for the first time. By choosing to review the results of the test, I have read and agree to the TestKit Terms of Service and TestKit Terms and Conditions related to participation in this test. 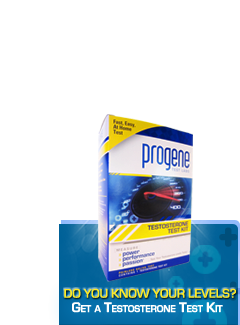 © 2012 Progene HealthCare, Inc.
Progene is a registered trademark of Progene HealthCare, Inc.
Progene was formulated to gradually supplement existing natural processes. As a natural, non-synthetic solution, individual results will absolutely vary. Remember that not all supplements are for everyone. If you are taking drugs that require a prescription to regulate blood pressure, to control cardiac conditions, or have prostate issues, ask your doctor if Progene is right for you. The individuals shown may be renumerated models and depending on the page, may or may not be actual Progene customers. These statements have not been evaluated by the Food and Drug Administration. Progene is not intended to diagnose, treat, cure or prevent any disease.